Earlier this morning I found myself writing a long, waffly comment on Facebook. As I typed out the final sentence a question struck me: why am I writing this? It’s not as though more than four people will ever read it, and Facebook – an “ever-burning fire of our memories” – is not the place to store such ponderings for posterity. So why bother? …I have absolutely loads of work to do. While we were there, we noticed nice signs on some of the houses which seem to have been designed and made in the same place. We took photos of them and I thought I’d post them here. 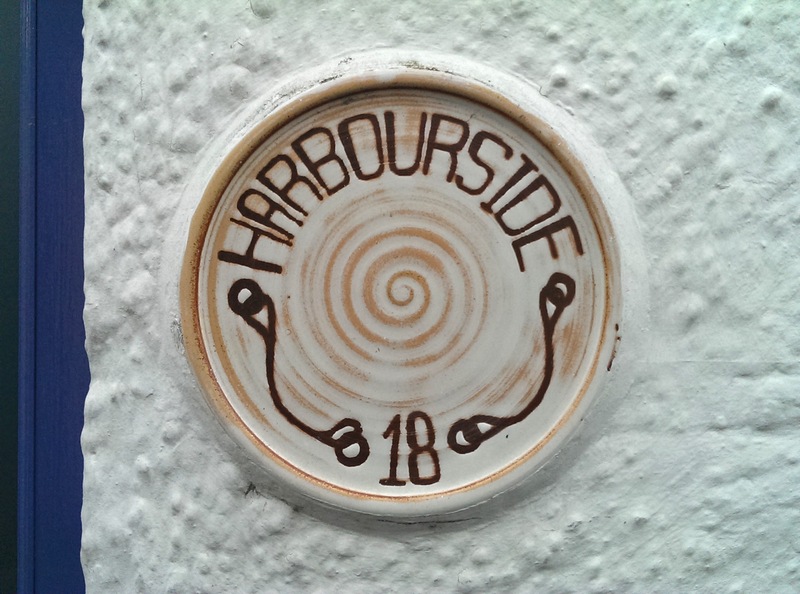 In 18 Harbourside you can see the hallmarks of this sign-maker, with the scorched-clay cream and terracotta colours and concentric circles emanating from the centre. The designer’s interest in typography is also evident. The font reminded us of the famous Computer typeface, but that might not have been intentional. This next one is the first example of the boat motif appearing in these signs. 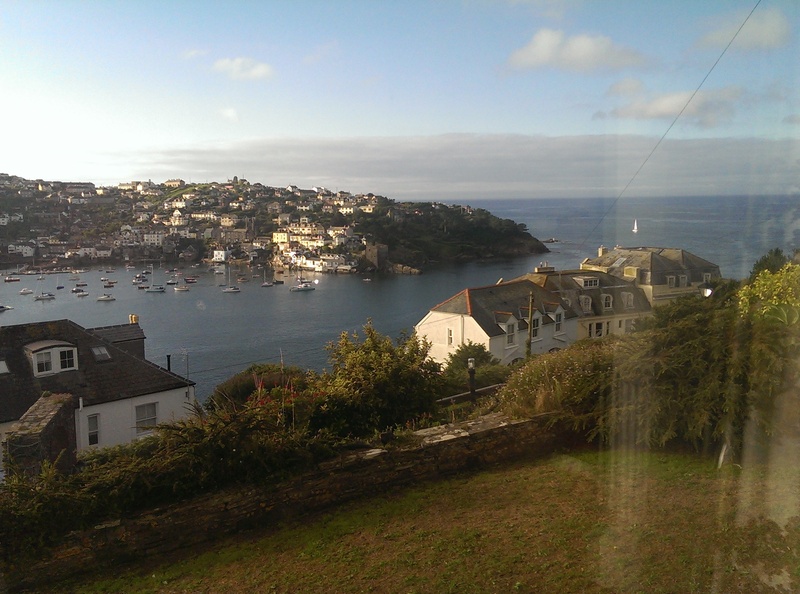 Fowey is a harbour town so boats are a bit of a thing there. Again, lots of attention has been paid to the typeface, which is a block Roman with slightly sloping serifs. Staring at it long enough you start to see some imperfections in how the type is laid out, but that’s to be expected as this wasn’t done in Photoshop. Here’s the smallest and most boring one. We spotted it towards the end of the trip, after we’d seen all the other signs, and only photographed it because we recognised the style. If I’d walked past this sign on its own I don’t think I’d have given it a second glance. 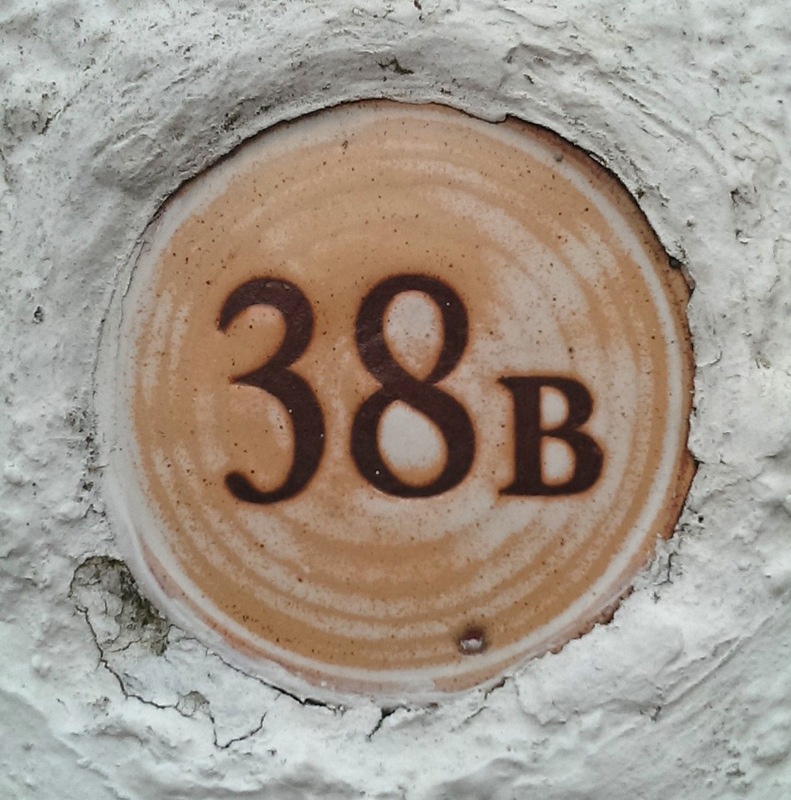 It’s still a nice sign though, especially the style of the numbers, although the “B” sits a little too low. So now we’ve got 38B out of the way let’s move on to the last two which, you’ll be pleased to hear, both feature boats. 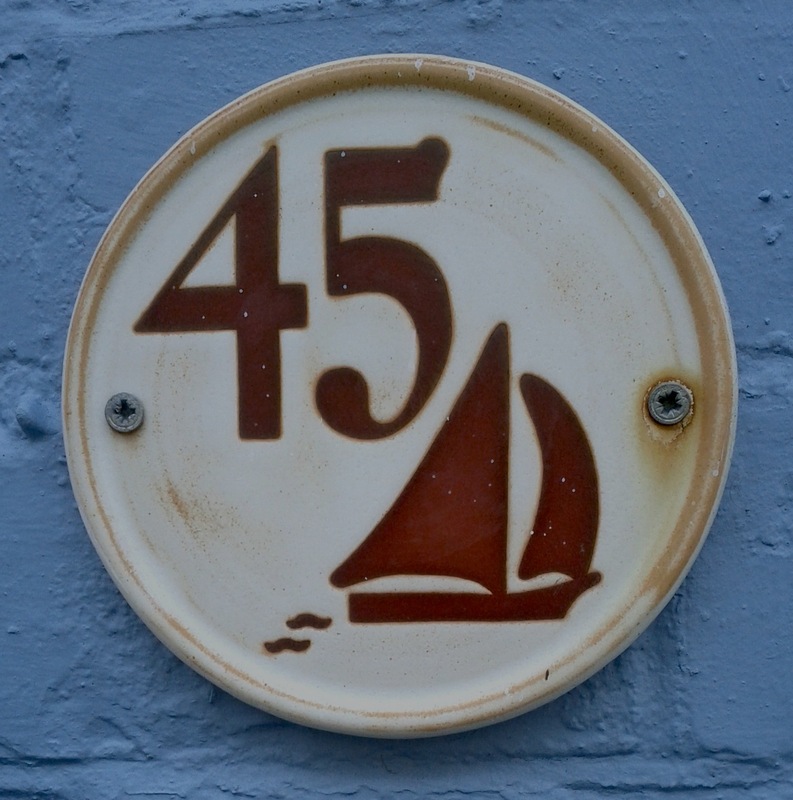 Number 45 is quite a simple and compact arrangement with only three elements: the number, the boat, and a couple of squiggles representing the sea. The style of the numbers is a bit more distinctive than in the previous signs where the designer seemed to be using other typefaces as a template. He or she seems to be discovering a form of their own, which is nice to see. As good as it is though, number 45 is a test run for the best of the bunch: number 53. This sign wins on every score. 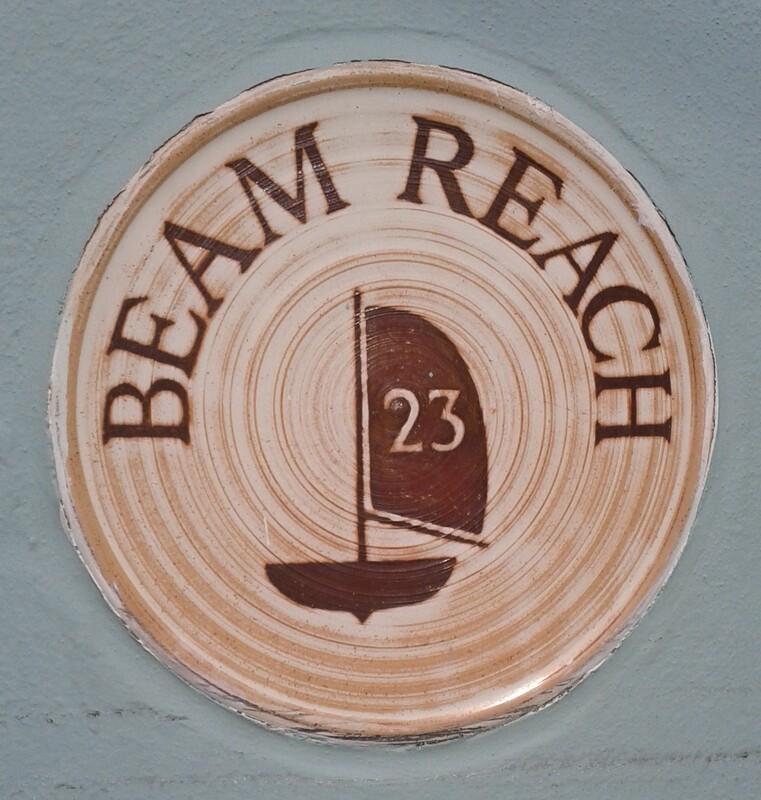 Firstly, the concentric circle effect has been toned down – it’s still there, part of the sign-maker’s design language, but it’s not in your face like on 23 Beam Reach and it doesn’t do any fancy spiralling like on 18 Harbourside. 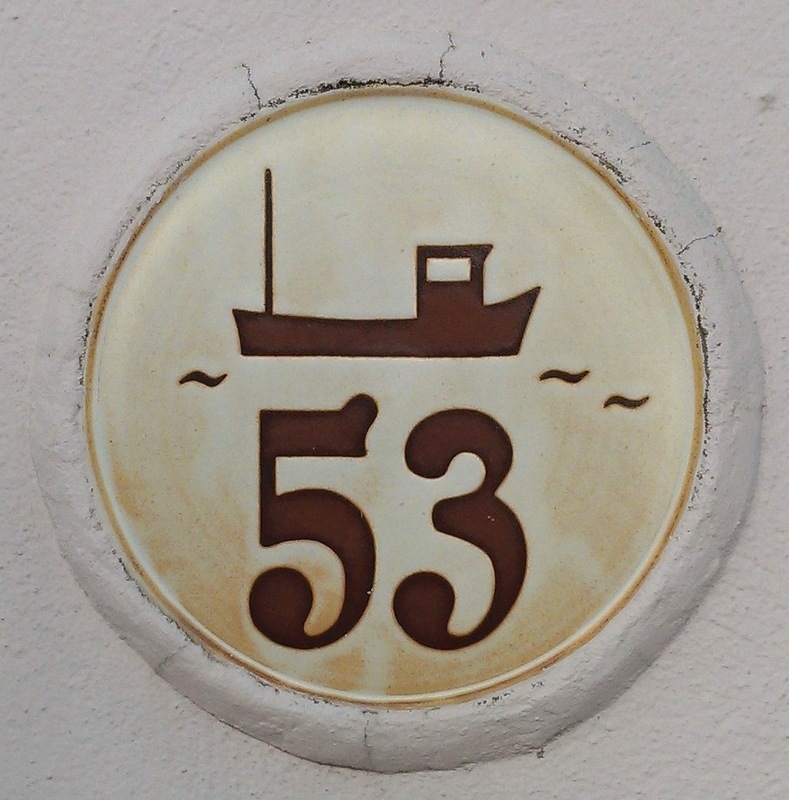 Secondly, the composition, with the boat centred above the numbers and the mast lining up with the left hand side of the 5. There’s a lot of empty space in the sign but it’s being put to work by how well the sign is laid out. Thirdly, the design of the boat itself. If you ask me it has more character: a ‘working’ boat, unlike the others which look like yachts for leisure. I know nothing about boats though so maybe you shouldn’t ask me. And then finally there’s the numbering, which takes the distinctive, personal style of number 45 above to the next level. It has some similarities to Souvenir, a classic 1970s typeface (from 1914, natch) but it really has its own personality. Next time we go to Fowey I’m going to try to find more of these signs and to figure out where they come from. In the meantime I’ve created a set on Flickr with the photos above. If you know anything about them, leave a comment! Last week an article appeared on the BBC news site with the headline “How to eat healthily on £1 a day“. A cynic might say that the article set out to alleviate the guilt of wealthier people about the hardships endured by the poor, and to provide an answer to the ludicrous public debate about whether someone can actually live on £53 per week. After all, if you can eat healthily on £1 a day, what could all these people who are having their benefits cut possibly be moaning about? But wait! A detailed takedown of the article posted at Aethelread the Unread appears to support an alternative conclusion, namely that it is in fact a load of codswallop. A 50g can of anchovies costing 79p is factored into his budget at 16p for 10g, and the remaining 40g simply vanish. Or perhaps he feeds them to a magical cat that defecates coins to the value of the food it eats â€“ that’s one way of explaining how he doesnâ€™t have to account for the money he spends on food he doesnâ€™t eat. All in all the amount he would really have spent works out at just under £40, nearly 8 times his original budget. I recommend you go read the entire thing, it’s a brilliant expose of a misleading and insidious piece of journamalism. So Google is shutting down Google Reader as of July 1st 2013. We know Reader has a devoted following who will be very sad to see it go. We’re sad too. Google announced today that they will be shutting down Google Reader. This is something we have been expecting for some time: We have been working on a project called Normandy which is a feedly clone of the Google Reader API… When Google Reader shuts down, feedly will seamlessly transition to the Normandy back end. With people like Feedly preparing to step up when Google steps down, it looks like the asteroid hurtling towards Planet RSS will be obliterated or diverted and cast off harmlessly into space. So we can all breathe a sigh of relief about that. Given that this is the internet and everyone has to have an opinion about Google Reader shutting down, here’s mine. I think Google has a right to do what it wants with its products, so if they want to shut it down then fair enough. As a user of Google Reader however I have a right to be annoyed that it’s closing down. In my line of work the phrase “put the user first” is something of a mantra, so while I’m tempted to stroke my chin and consider this from Google’s perspective as a question of strategic resource deployment or whatever I’m going to approach it instead from the user’s perspective – my perspective – and give Google a thumbs down on this one. Bring back Google Reader you scoundrels! And so on. I bet Larry Page is quaking in his boots. Thanks Google, I would never have guessed! Some people have hobbies. Other people are obsessive… @Kya7y recently unearthed an incredibly detailed maze that her father created almost 30 years ago. When pressed for details, the father explained that he spent 7 years creating the map on A1 size paper, which is about 33 x 23 inches. Here’s just one picture of the maze – read the full article for more. From a distance it looks like the street plan of a city located on a comically overpopulated alien planet, but as you descend from its upper atmosphere and approach street level a different feel emerges: organic, messy, neural, brainlike, obviously human. A feel it wouldn’t have if it had been made on a computer. You can’t help but be impressed at the level of detail, the dedication and the craftsmanship that went into creating it. The sensation it leaves me with is a bit like looking into another person’s mind as they drift off to sleep and dream-thoughts start warping the linear flow of waking consciousness. So I’m left wondering. Is it best understood as a maze, or as a streetmap of its creator’s mind? Did Flaubert foresee Google Earth? In Gustave Flaubert’s Un Coeur Simple (1877), FÃ©licitÃ©’s nephew Victor has travelled to Havana. An uneducated and illiterate domestic servant, FÃ©licitÃ© doesn’t know where Havana is and can’t form a mental picture of her nephew’s whereabouts, so she asks the solicitor Bourais to show her on a map. He reached for his atlas… picked up his pencil and pointed to an almost invisible black dot in one of the little indentations in the contour of an oval-shaped patch on the map. ‘Here it is,’ he said. FÃ©licitÃ© peered closely at the map. The network of coloured lines was a strain on her eyes, but it told her nothing. Bourais asked her what was puzzling her and she asked him if he could show her the house in which Victor was living. Bourais raised his arms in the air, sneezed and roared with laughter, delighted to come across someone so simple-minded. Poor FÃ©licitÃ©: she wasn’t simple-minded, she was just ahead of her time. If Bourais had a laptop running Google Earth her request would have been perfectly reasonable. The apology Apple published after losing a UK court case to Samsung has not gone down well with the judge who told them to publish it. If you’ve read it you probably won’t be very surprised. The statement was meant to clarify that the Galaxy Tab did not copy the design of the iPad as Apple had claimed. Instead, it mainly painted Apple in a positive light by talking about cases in other countries that had gone in the company’s favour and quoting the judge’s favourable comments about the iPad. It didn’t take a legal expert to realise that the court would want to have a word about it. On 9th July 2012 the High Court of Justice of England and Wales ruled that Samsung Electronic (UK) Limitedâ€™s Galaxy Tablet Computer, namely the Galaxy Tab 10.1, Tab 8.9 and Tab 7.7 do not infringe Appleâ€™s registered design No. 0000181607-0001. A copy of the full judgment of the High court is available on the following link www.bailii.org/ew/cases/EWHC/Patents/2012/1882.html. The most artful thing about the statement isn’t the point-scoring that follows (and which I’ve not included – see the full wording here) but the placement of the legally required statement within a thicket of technical-looking jargon that acts like chaff to the reader. The eye starts tripping over the words as the various Galaxy Tab model numbers are repeated and then, upon detecting the intimidating-looking patent number a bit later on, decides to move on the more welcoming second paragraph. With any luck many readers will abandon that first paragraph before they read the three legally meaningful words – “do not infringe”. It’s a deceptively simple trick but one that any devious writer would do well to master. If you’ve got an unwelcome message to deliver, boil its essence down to the smallest combination of words as possible, put it in a much longer and generally upbeat text, then clog up the sentence around the unwelcome words with as many numbers, hyphens and other gibberish as possible. Yesterday I was coming home from work on my bike. I rode up Goswell Road, then turned right on to the cycle lane that connects City Road with St John Street, keeping cyclists at a safe distance from Angel junction and its constant, deadly game of bus Tetris. If you cycle from north or east London into the centre you might know this cycle lane. It’s shared with pedestrians and has a few red lights where it crosses the major roads. You never have to wait all that long at the red lights, but being London cyclists, it’s fairly common to see people jumping them anyway. So yesterday I was waiting at the red light on City Road, facing east, when one cyclist zipped past me. I did my usual thing of tutting but the road was quiet so it didn’t seem like much of a big deal. Then another cyclist came past. She crossed on to the northbound lane of City Road right into the path of an oncoming bus, which was – quite legitimately – about to drive through the green light we were waiting at. The next bit seemed to happen in slow motion. An emergency stop was carried out by the bus driver, and the bus tipped forward as it came to a halt. The cyclist didn’t stop, but instead continued on a bit more slowly, looking at the bus in confusion, perhaps wondering if the bus was the transgressor. Another waiting cyclist behind me shouted “idiot!”, which probably cleared things up for her. She cycled off. I looked inside the bus. The driver looked rattled. Buses that do crash stops are dangerous places, especially at rush hour – when gravity goes horizontal all of a sudden and people start flying along the aisle, serious injuries can happen. Luckily though this bus was nearly empty so it didn’t look as though anyone on it was hurt. The cyclist who caused that bus to do a hard stop may or may not have considered the safety of the bus passengers. What seems more surprising is that she didn’t seem to consider her own safety either. There are enough dangers facing cyclists in London, enough deaths and injuries, but it doesn’t help at all when cyclists put themselves and others in danger to shave a couple of seconds off their journey time. The guy who shouted “idiot!” had a point.